As many are aware of, a couple of the buildings here on campus have been under extensive construction for a while now. 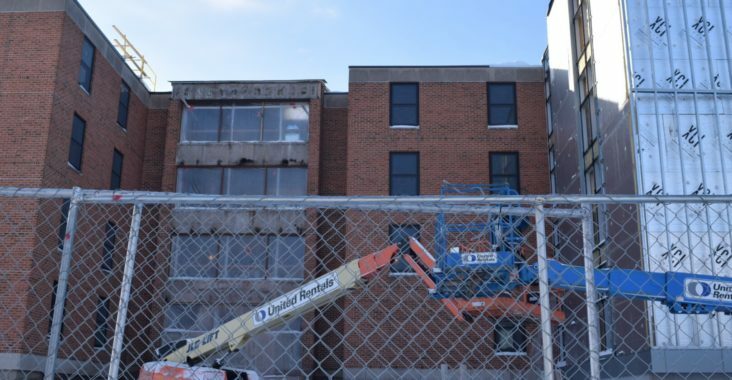 North Hall is being completely reconstructed and as a result, students have been moved to Tainter Hall which had to be updated before they moved in. The Commons is being renovated as well. Lastly, Bowman Hall has been getting a facelift for the school year. According to a recent survey, students are over it. Constructing workers have confirmed that the estimated time for finishing the construction is never. “Yeah we are really going to put our backs into it to never get this done,” said Ron. “We just got to take it one brick at time, which means one brick a day, now stop bothering me. I have to watch this paint dry,” said Supervisor Edward Jones. “I definitely saw a few of them playing hide and go seek in North Hall when I walked past,” said student Roger Rabbit. “When I asked them about it, they told me to mind my own business,” said Rabbit. “They also started a rumor that there is ghost infestation in North Hall,” said Sam Smith. “We all know they only said that because they don’t want anyone sniffing around their site,” Smith continued. Some other unproductive behavior by the construction workers that was witnessed by students and staff is seeing workers leaving early to hit up the bars and taking up multiple parking spots just for fun. It is apparent that construction workers have no intention of speeding the process up at all. “We plan on never being done, my wife and I recently moved a little closer to campus so that my commute is a little closer,” said construction worker Austin Powers. Since things don’t look like they are going to change anytime soon, students and staff are going to have to adjust the sights and sounds of construction. “We actually purposely make unnecessary loud noises when class is going on,” said informed construction worker John Tucker. Professors who are annoyed with the loud noises of construction are going to have to get used to it.